The Gourami and Betta fish species presented here have the ability to breathe air from the surface of the tank when oxygen levels are low or depleted in the aquarium water. This ability comes from a specialized organ called the labryinth organ. If you are keeping one of these species, try to keep a bit of open space above the tank water for them to use this organ if necessary. These fish also have the reputation of not getting along with members of the same species, especially bettas. Do not house multiple male bettas in the same tank. Use caution when the other species when keeping multiple males in the same tank. You may also see some aggression dealt out by these fish to their tank mates (other species) in cramped quarters. The Kissing Gourami can be especially annoying at times regarding its behavior toward tank mates. 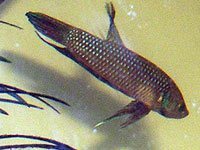 The Betta is ubiquitous and is a favorite for many fish keepers. The fairly hardy Blue Gourami gets to be about 6 inches as adults. Can be temperamental with other gouramis. 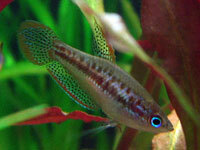 The Dwarf Gourami is another beauty that can get aggressive with other dwarf gouramis. Needs a very large aquarium and grows too big for most tanks. Best to keep only one Kissing Gourami per tank because they will pester smaller Kissing Gouramis. The kissing action is actually an act of aggression. The Mahachai Betta is a wild caught betta. The Mahachai Betta is one of the newest additions to the Betta world.